…. every now & then several weeks whizz by when the To Do list never seems to get shorter in spite of working flat out. Never enough hours in the day. I never used to understand that phrase but then that was back in the days when the in-thing was Don’t Worry ,Be Happy and when there wasn’t as much traffic on the roads. And on top of the ever lengthening list, this blog just suddenly decided to transport itself back to December 2011… I lost all the other posts 🙁 After much wailing and gnashing of teeth I eventually got it all back to how it used to be but only up until July which meant I had to rewrite the last couple of posts from memory ( will be keeping duplicates from now on!) My apologies to all who left comments which have now mysteriously disappeared. Well here we are, yet again at the end of another season. I am home alone with plenty of time to reflect on the last few months. Emma has gone off to Spain on a 3 month exchange with the school ( I hugely embarrassed myself and my dear husband by sobbing like a baby, my face like a crumpled 2CV * ,as I waved her off at the school gates ), Amar is away to visit his family for a couple of weeks and Alistair is in his own teenage world, so is sometimes here but mostly he’s completely on another planet. All the guests have left apart from one lone couple who asked to stay on another week. The Autumnal weather has descended on us out of the blue and I am reminiscing about the glorious Summer weeks we had with all the lovely guests, both those who came back to stay with us yet again ( some on their 5th visit!) as well as all the new people who gave us a chance and have already booked again for next year. Our lives are all the richer for having met you. Huge, huge thanks to you all for genuinely making earning our living so enjoyable! There were many highlights – long apéritifs on the terrace, several big BBQs with all 7 gites joining in and creating such a warm & homely atmosphere, boules tournaments, golf tournaments and quite a few community events where some of our guests got to see real French life at its best! The Brocante aka the car boot sale! 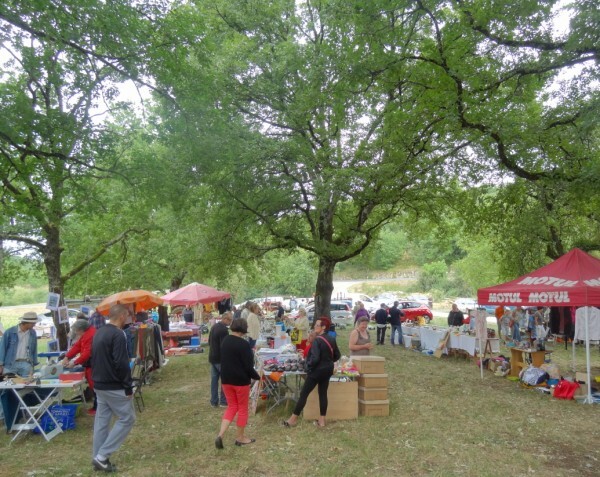 The last of these gatherings was in La Cassagne at the end of August – this is an all day affair starting at 8am with a car boot sale,more romantically known here as The Brocante. Alistair was determined to hone his entreprenurial skills and persuaded me to take him and half the contents of his bedroom along there at 7.45 am to set up his pitch. After weeks of sweltering drought it chose that very day to pour with rain and in spite of all the professional car booters packing up at lunchtime he was adamant that he was going to sit it out and only gave in once he had amassed the princely sum of 75€ and reckoned he had earned enough not to feel a complete failure. alternative army barracks arrangements for inclement weather! We did go back at night though for the meal and music! The dodgy weather meant that people had to eat in individual tents – all a bit bizarre with a touch of an army barracks feel about it but still great fun! 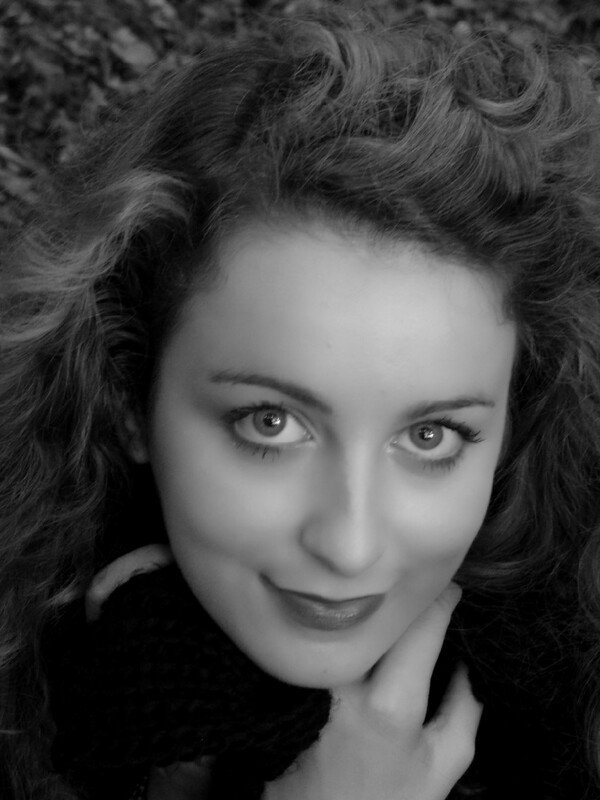 Emma was invited to sing at all of these local events & over the Summer has gained enough confidence to cast her singing net a little bit wider. Here’s her YouTube debut… Please do have a listen and if you feel an overwhelming compulsion to share it with everyone and his wife, honestly we won’t mind – in fact it would be an honour 😉 I apologize profusely for my unashamed and overt plug for my daughter, but then if a mother can’t, who can? Just think of a crumpled 2CV as you click the link!! Emma Elle Jo - YouTube Debut! Props courtesy of Les Crouquets - many of our young guests are very familiar with the remains of this delightful classic car !!! This old car is a source of fascination for all of our young guests who usually manage to persuade Alistair to give them a guided tour through the woods. Sadly it’s not uncommon to find such treasures abandoned in the middle of nowhere. We secretly harbour a far- fetched fancy of one day towing it out and restoring it to its former glory but for the time being it’s still there. Anyway, I have rambled on a bit and probably given Amar much ammunition to back up his claim that I spend far more time than is good for me in front of the computer. I completely understand your feeling of being alone as Alistair is in his teenage world. Bryony is off up to Newcastle for another year and Dominic is off to Malvern for a couple of nights. But actually I’m positively excited about a little bit of alone time for me. But there are so many choices and really ironing shouldn’t be one of them! I loved listening to Emma’s videos, she has an amazing voice and I am sure it will open doors to an interesting career. Emma has a lovely voice. We certainly don’t envy you all the ironing Elena – Elizabeth remembers it all too well! 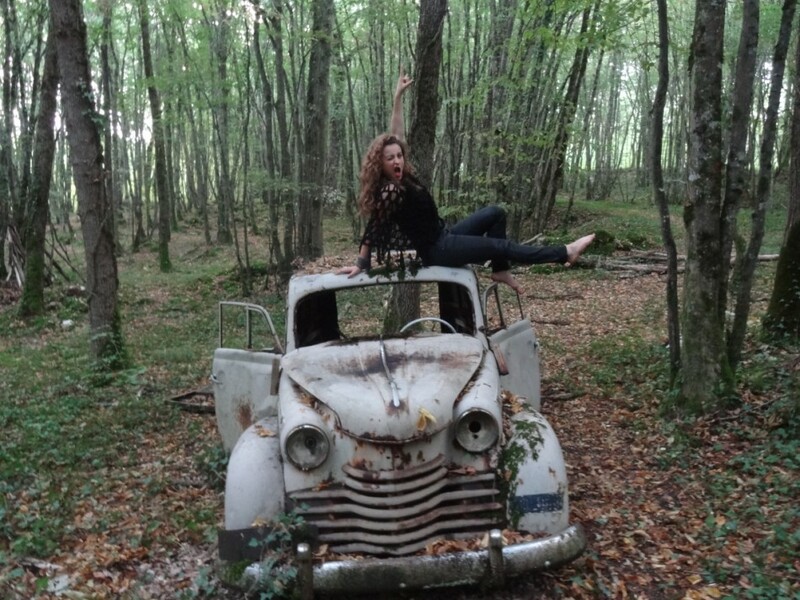 The car in the woods was there before our time at Le Crouquet, neither Maguy, or her husband Rene knew where it had come from. Ah, the car…!! Not sure quite what the huge attraction is but if any of our young guests go “missing” they are invariably at the car!! !It must be the most photographed wreck in the Dordogne!